My kids have joined the Fortnite craze and as a result, I have made my first DIY Fortnite Costume. Perhaps there are more Fortnite costumes on the horizon, we shall see. For now, check out this fun Tomato Skin Fortnite costume. The bulk of Tomato Head Fortnite costume is regular clothes with a few modifications and an oversized head made from a large paper lantern. First, you need green pants and a green long sleeved shirt. We bought a green sweatsuit at Target that works pretty well. The sweatshirt and pants match each other and could be used again when the weather is cooler. The sweatshirt does have a hood but I thought it was a good compromise since green pants aren’t super easy to find. I used duct tape to add orange around the wrists of the sweatshirt. And a piece of brown duct tape to create the patch on the left leg of the sweatpants. An embellished red tank became the pizza jersey by adding strips of white duct tape. I also bought a purple polo at a thrift store and cut off the collar. Then I hand sewed the purple collar to the neck of the red tank. The last detail is a pizza graphic on the center of the tank. Not just any slice of pizza, a slice of Hawaiian pizza! Download my Fortnite Pizza graphic here. I considered printing it on sticker paper but ended up just printing it on cardstock and using double sided tape to stick it on the jersey. We covered shin guards with orange duct tape and cut the tips off a pair of purple garden gloves to create the fingerless glove look that Tomato Head wears. I splurged on a new-ish pair of boots since Elliot didn’t have any. They were in great shape and only $12. They are perfect for the costume and can be worn again. The hardest part of the Tomato Head Fortnite costume is the oversized tomato head. I decided to go with an extra large paper lantern to create the head, I’ve created a few paper lantern projects, so I’m fairly familiar with them. I couldn’t find a large red paper lantern locally, so I ended up painting a 16″ white one with red acrylic paint first. If you go that route make sure you wait for the paint to be completely dry before moving on to the next step. I cut a hole for his head on one side of the paper lantern directly in the middle. You can’t use the existing holes on the top or bottom of it without comprising the integrity of the paper lantern. Use cutting pliers to snip the wires before using scissors to cut the hole. I suggest making a smaller hole and gradually making it larger as needed. Cover the edges of the hole with red duct tape. This prevents the wires from poking you and also from the hole from ripping further. I used green pipe cleaners and felt to create the leaf and stem top. I used a simple leaf graphic I found online to use as a template. Then push a little of the stem through the head and cover it with red duct tape on the inside to hold it in place. I then used my Cricut to cut the Tomato Head face out of vinyl. The top of the paper lantern had the smaller pre-existing hole, so that’s where I placed the vinyl stickers to create the face. There was a small hole left between the two eyes that you can see out of when wearing the Tomato Head. Cut your own Tomato Head face with this Cricut file. Or you can use this image as a template for making the face another way. Paper mache is another way to make the round head. I am just not a paper mache girl. If you are interested in trying paper mache, check out this youtube video for a Tomato Head I found. I used a plain red backpack to create Tomato Head’s pizza basket. I used black duct tape cut in half lengthwise to create the edging. Then added a piece of black construction with the same pizza graphic from the shirt. It will double as a candy bag for trick or treating! What are some other fun Fortnite costume ideas? I asked my kids and they think the following characters would all make cool Fortnite costumes: Drift, Ragnarok, and Raptor. A Zoey Fortnite costume starts with a bright green wig. Then you can embellish a cold shoulder hoodie and leggings. Don’t forget to add gold spurs to a pair of simple gold sandals. One popular and possibly easy Fornite costume to make would be a Havoc Fortnite costume. He relies on a military gear and lots of grey camouflage. These are items that you may own, be able to borrow or find at a thrift store. Or go the easy route and buy online. I found a grey camouflage sweatshirt, grey camouflage pants, grey camo beanie, heavy duty black gloves, and black bandolier. You could DIY a couple of big red pieces of ”ammo to add to the bandolier. Making a Drift Fortnite costume for Halloween is fairly easy because there are Drift costume masks available to purchase. The rest of the Drift Fortnite costume is easy to pull together, check out this Drift Fortnite costume tutorial for details. Quinn hasn’t picked a Halloween costume yet, so I might have another Fortnite costume on my docket this month! Are you looking for more information about Fortnite costumes? Here are some other things you should know. How to get a Fortnite costume for free? I think most game players want to know how to get a Fortnite costume for free in the video game. I don’t think this is possible. You could almost make a DIY Fortnite costume for free in real life though. Our Tomato Head Fortnite costume was pretty inexpensive. Especially if you modify things you already own or borrow most of the items. How to get a new Fortnite costume? The easiest way to get a new Fortnite costume in real life is to buy one ready-made. There is a Fort nite Skull Trooper or Tricera Ops on Amazon. 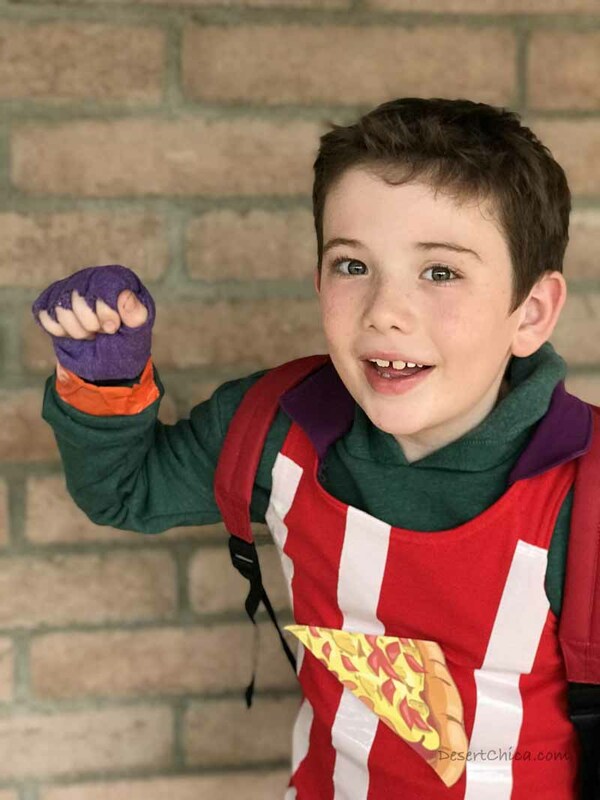 My favorite way to get any costume is to make a DIY one, like our DIY Tomato Skin Fortnite costume. If you are asking how to get a new Fortnite costume in the game, then you have to buy V-bucks to buy the battle pass and earn new Fortnite skins or you can buy skins with V-bucks in the daily shop. Every day there are new skins or costumes for sale. This is another video game related question. Epic Games and Twitch partnered up to give Twitch Prime subscribers the opportunity to get exclusive Twitch Fornite costumes or skins. You can read more about it on the Twitch Blog. Hi! I am in the process of making this costume for my son but I am having trouble with the head. I am wondering how you got the head to stay straight on his head? When my son puts his on it just wobbles everywhere. Thank you in advance! P.S. Love the costume ???? yay! I am so glad we could help with a costume. So my son is able to fit the top of his head in between the two metal frames inside. Its snug (and comfortable) enough to keep it in place. If that doesn’t work, then maybe use some red duct tape at the back of the head to ‘tack’ it gently to his shirt? Hey! I am making this for my son but can’t find the five to use to cut the face with vinyl. Did you make this file or have a website to purchase it? I made the file and then forgot to save it. DUH! I just remade it last night though for you and added to the post! This is a life saver!!! Nothing like last minute costume making 😉 Can you please share what size of round paper lantern you used? Is that the 18″? THANK YOU!!!!! Your welcome! I used a 16″ one. 18 would probably work too.